The sizzling summer season is here and Lancaster is the hot spot for mouthwatering tastes. And some of the best flavors you can get don’t come from a restaurant: they come from food trucks! From bold burgers to refreshing ice cream, Lancaster is bursting with delicious food trucks you can find all around town. We sat down with three of Lancaster’s best to get the tales of the trucks. Behind each scrumptious meal is a story that began with a question: will this work? Here are 3 food truck features that’ll make you hungry—and inspire you to go on a downtown adventure to sample and savor these unique local foods. 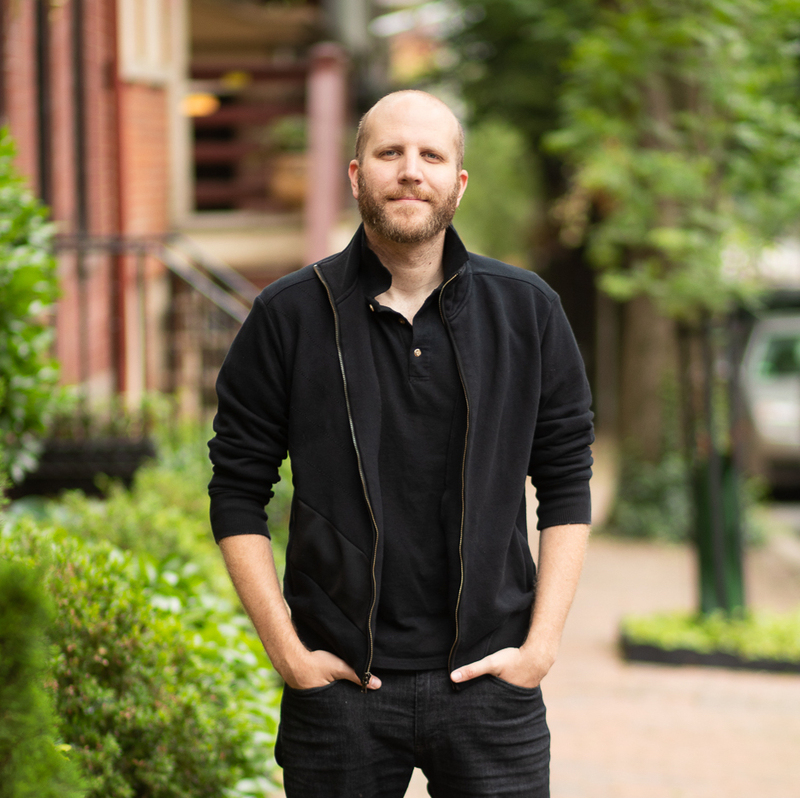 Joe Smoker from Lancaster Burger company began his career in a corporate setting—until he decided a desk job just wasn’t his style. Discover all kinds of juicy burgers on their menu including The Original (cheddar, mayo, lettuce, tomato, and raw onion), the Black & Bleu (blackened seasoning, aged bleu cheese, crisp local lettuce and tomato), BBQ Bacon (cheddar, BBQ sauce, seasoned bacon, and caramelized onion), Sunrise (pepper jack cheese, bacon, and a fried egg), and more! There are even black bean and turkey burger options as well to put a new spin on a classic. “We source as much locally as we can,” Joe said. “We keep it fresh and as local as possible.” The ground beef is raised right in Lancaster, PA and many vegetables are from Central Market. But it’s not just burgers that keeps customers coming back for more—the french fries (regular and sweet potato) and milkshakes round out the menu. With Lancaster Burger Company, it looks like Joe was able to do just that. 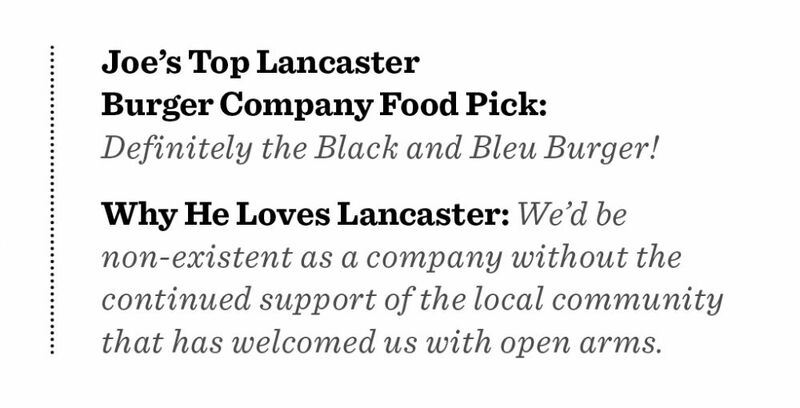 Locate where Lancaster Burger Company will be next! Visit their website and find out more. Mike Kambouroglos is passionate about the delicious food options from Souvlaki Boys. And he has good reason to be: this food truck—and restaurant—serves incredibly delicious real Greek street food that will have you imagining you’re in the heart of Greece. 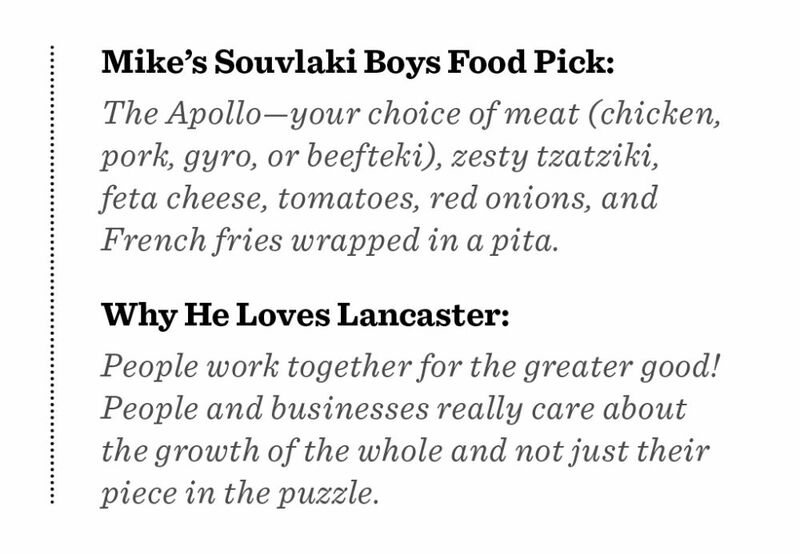 Started by Mike and Pete in the summer of 2012, Souvlaki Boys began as a place to ensure genuine Greek cuisine was offered in the Lancaster area. And now Mike continues the dedication to offering authenticity as the forefront of the menu. Mike combined his love for Greek food with inspiration from LA and Portland—places he visited often in his travels. Mike found himself living that dream too. The hype paid off when they first opened Souvlaki Boys a few years back. From Signature Pitas including the Classic (choice of meat, tomatoes, red onions, fries—yes, french fries!—and tzatziki) and the Zeus (gyro meat and chicken souvlaki with tomatoes, red onions, romaine, feta, fries, and tzatziki) to salads, small plates, and dips and spreads, the menu is full of scrumptious options. This authentic taste can be described—but it’s best experienced in person. “This is the street food that is native to Greece.” And we can’t wait to indulge in it. Go online to find more information and see where the food truck will be next! 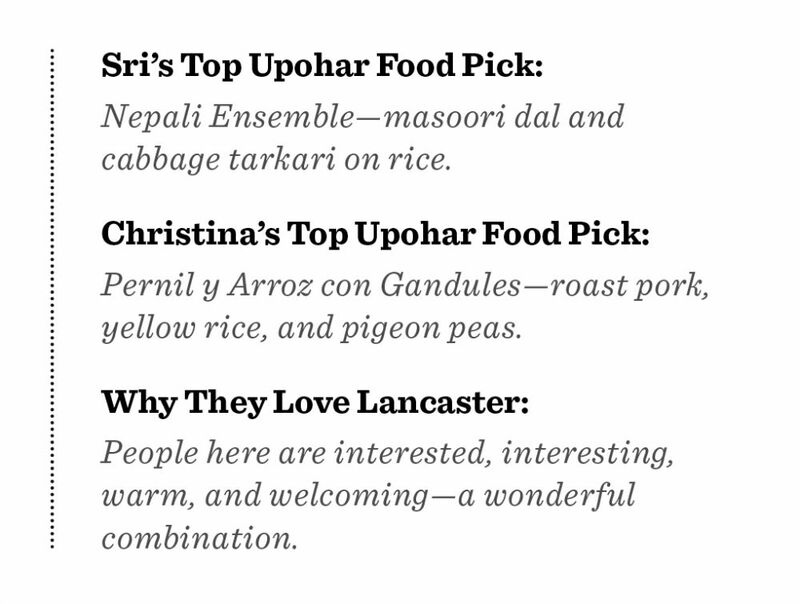 Upohar, meaning “gift” in Bengali, is a food truck—and more—in Lancaster that focuses on a powerful social mission while serving global fare specializing in vegan, vegetarian, and naturally gluten-free food. Sri Dasgupta, creator and owner of Upohar, wanted to begin something that was more than just a normal eatery. The mission of the business is straightforward: offer local women and refugee women fair income for work. This helps create a successful, and sustainable, way forward for the women to thrive while ensuring there is reliable income along the way. And it’s ever-evolving. Now Sri has merged with Christina Maldonado’s business–Christina Catering–to provide even more opportunities to taste delicious global flavors. “Upohar officially merged with Christina Catering this past January,” said Sri. “Now we are at Central Market, we do catering, and have other channels coming soon.” The new walk-up window is now open at 30 West James Street and is full of great on-the-go meal options! As for the food truck, there is a standard menu of delicious items that are the best-sellers and most popular. Items like SubSaharan African Ensemble (Central African Peanut Stew—eggplant and bell peppers in a rich peanut sauce—and Congolese Kale—kale sautéed with tomatoes and onion—served with Dijollof Rice—basamati rice cooked with tomatoes, onions, and aromatic spices) and the Moroccan Ensemble (Vegetable Tagine—mied vegetable stew with artichokes and black olives served on couscous cooked with onion and tyhyme) are amazing entrée choices. Or you can taste the food and flavor of Puerto Rico with the Pollo Asado (basked chicken served on yellow rice with pigeon peas) and Puerto Rican Empanada (fried empanada with your choice of beef and cheese or chicken). Is your mouth watering yet? Upohar is more than a meal—it’s impacting, and enriching, lives as part of a business vision. Experience Upohar by locating the food truck online and taste the flavors of the world without leaving Lancaster!